Last week, Juan Manuel Corzo [es], Senator and president of the Congress of Colombia, caused outrage when, in order to justify a fuel subsidy for congresspeople [es], he told W Radio [es] that it was impossible to fill the gas tanks for his two vehicles with his COP$16 million (€6,418 or US$8,784) salary (the minimum wage is COP$535,600, €207 or US$279). Despite living in a middle-ranked oil producing country, Colombians pay, as of August 2011, COP$8,635 (€3.34 or US$4.51) average per gallon, more than Americans. During the next few days, Twitter and Facebook users showed their contempt [es] toward Senator Corzo, a member of the Conservative Party, with hashtags like #juanmanuelcorzo, #fueracorzo (“get out Corzo [from Congress]”), or #corzoton (Corzo + Telethon); Facebook pages like “We demand Juan Manuel Corzo's resignation”; and an event scheduled for Tuesday September 27 in front of the National Capitol. Even Anonymous staged a DDos attack [es] against the Senate's website. 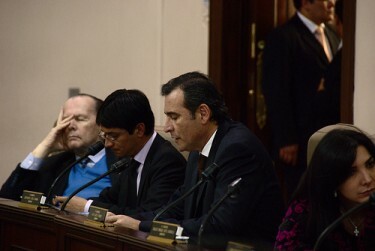 On Monday September 19, the issue became “personal” when Senator Corzo declared in a press conference that the Twitter users criticizing him were “rude,” and added that [es] “I'd rather not steal from the State and that [others] pay for my gasoline.” After that, Corzo claimed [es] he was going to an Assembly of the Inter-Parliamentary Union (IPU) in Azerbaijan to defend his controversial bill of parliamentary immunity, even though, as blogger Hernán Castro Rodríguez shows [es], the last IPU Assembly took place last April in Panama and the next one is scheduled for October in Switzerland. En un país con un salario mínimo de 300 dólares oír a un presidente del congreso llorando por sus cuitas de ricachón es un maldito insulto. In a country with a minimum wage of 300 dollars hearing a President of the Congress crying for his troubles of well-heeled man is a damn insult. Mientras tanto Corzo anda en Azerbaiyán y adivinen quiénes pagamos por su vuelo. Meanwhile Corzo is in Azerbaijan and guess who is paying his flight. Veo uribistas y antiuribistas (Antes fachos y mamertos) unidos en un solo #Corzoton Esa es la Unidad Nacional que sirve. Quien mas grosero nosotros los twitteros o #JuanManuelCorzo que nos quiere tratar de estupidos? Who is ruder: us Twitter users or #JuanManuelCorzo who wants to treat us like we are stupid? No joda, con 6 meses de sueldo se compra una estación de servicio, para que nunca vuelva a llorar por falta de gasolina. Leave me f***ing alone, with 6 months of his salary he could buy a gas station, so he never cries for lack of fuel again. Yo cuando grande quiero ser como Juan Manuel Corzo y que ustedes me paguen la gasolina. Lo de Corzo es más que #fueraCorzo. Hagan algo en la calle, no se queden en twitter. Construyan cultura política para que no se repita. The Corzo issue is more than #getoutCorzo. Do something in the streets, don't stay on Twitter. Build political culture so it doesn't happen again. A menos que la Registraduría empiece a hacer valer el RT como voto, la indignación por lo de Corzo servirá para mierda y media. Unless the National Civil Registry makes a RT worth a vote, the outrage about Corzo will be useless. Es la primera vez que un político nos quiere robar de frente, en la cara. Literalmente, Corzo nos pidió a los contribuyentes colombianos que le pagáramos la gasolina de los carros que utiliza -carros por los cuales nosotros ya estamos pagando-, simplemente porque no le alcanza con su oneroso sueldo -el cual también pagamos nosotros-. It is the first time that a politician wants to rob us overtly, in our faces. Literally, Corzo asked us, Colombian taxpayers, to pay for the gasoline fuelling the cars he uses —cars we are alreading paying for—, simply because his onerous salary —which we also pay— isn't enough. The post includes a table showing that all the Presidents of Congress in the 21st century (the post is occupied by a Senator elected by fellow Senators at the beginning of the legislature, every July 20), except one, have been investigated either for corruption or for ties with armed groups, including Corzo. Meanwhile, Ricardo Galán wonders [es] if the “I'd rather not steal from the State” remark by Corzo was a threat, blackmail, or a complaint; while Julián Rosero Navarrete, who has worked in Congress, supports [es] the general outrage but warns against discussing the issue based on erroneous information, and explains that the actual salary of a Congressman is COP$6 million (€2,321 or US$3,132), while the rest are “representation spendings,” which Corzo should be using to cover his fuel expenses. Ese Presidente del Senado no merece le puesto que tiene, que lo bajen por descarado e irreverente. Voy a unirme a la corzaton.